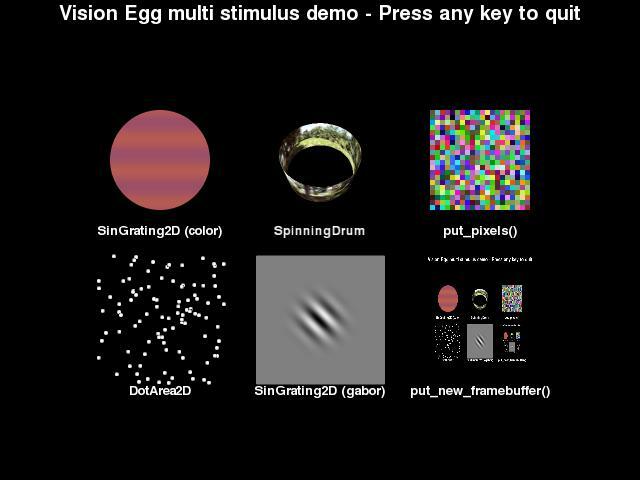 All of the screenshots below were produced with demos that come with the Vision Egg. 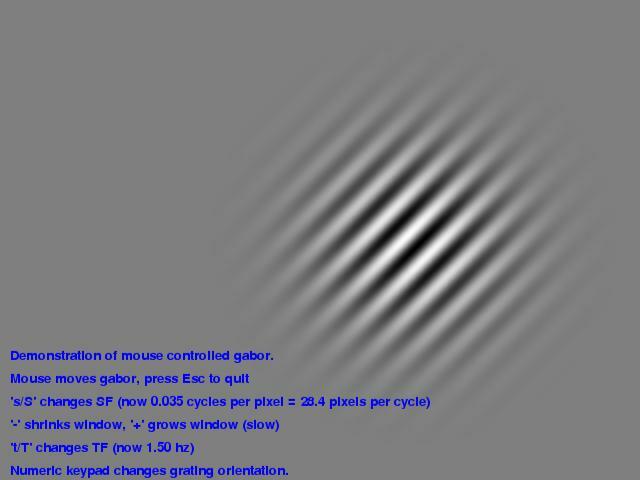 multi_stim.py shows a color sinusoidal grating (viewed through a circular mask), a random dot stimulus, a perspective-distorted drum from the perspective of a moving camera, a gaussian-windowed sinusoidal grating (gabor wavelet), ‘’blitting’’ of arbitrary pixels from a numeric array, and a (recursive) copy of the framebuffer. 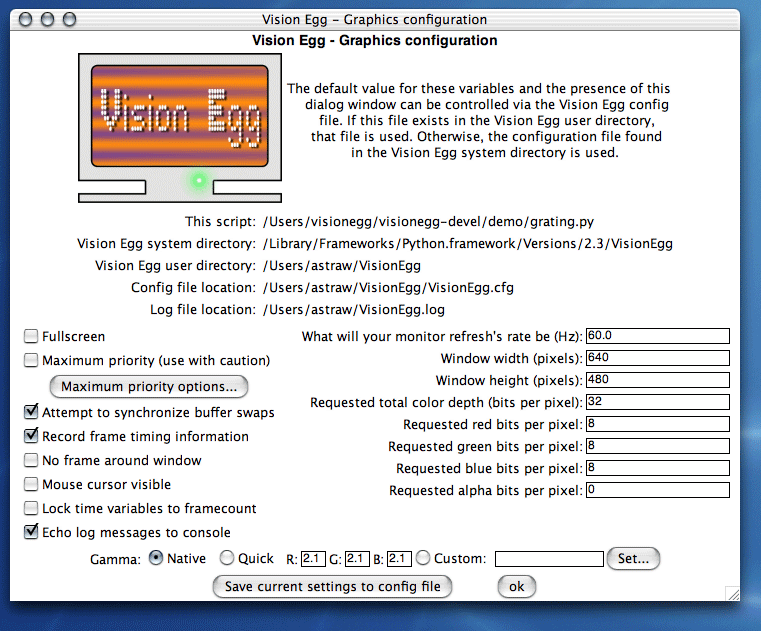 You can use the Vision Egg to play QuickTime (currently Mac OS X only) and MPEG (all platforms) movies. You can place them as normal textures, allowing you to reshape them, warp them with various distortions, or superimpose other graphics or text. mouse_gabor_2d.py illustrates that stimuli are generated in realtime. Parameters such as spatial frequency and orientation can be updated without skipping a frame. 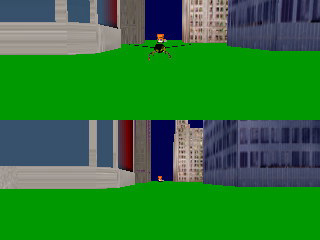 mouse_gabor_perspective.py shows perspective distortion along with realtime stimulus generation. Such wide fields of view are important for research on insects, for example, because many insects have a very large visual vield of view. 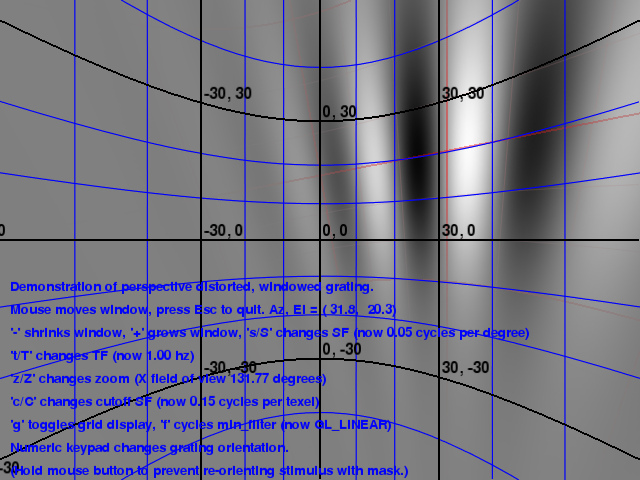 A grid of iso-azimuth and iso-elevation lines is superimposed on the grating in this screenshot. This grid represents visual coordinates of a fixed observer looking at the middle of the screen. A second, dimmer grid shows the reference coordinates system for the grating. 3D models in the .3ds (3D Studio Max) format can be loaded. See the future page for more information regarding complex 3D models. 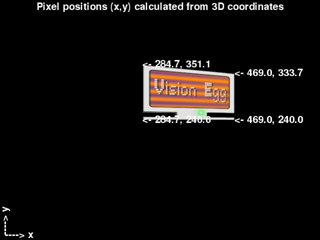 Coordinates given in 3D can be calulated to 2D screen coordinates. This may be useful for a number of reasons, incluing pasting text over important parts of a 3D scene. 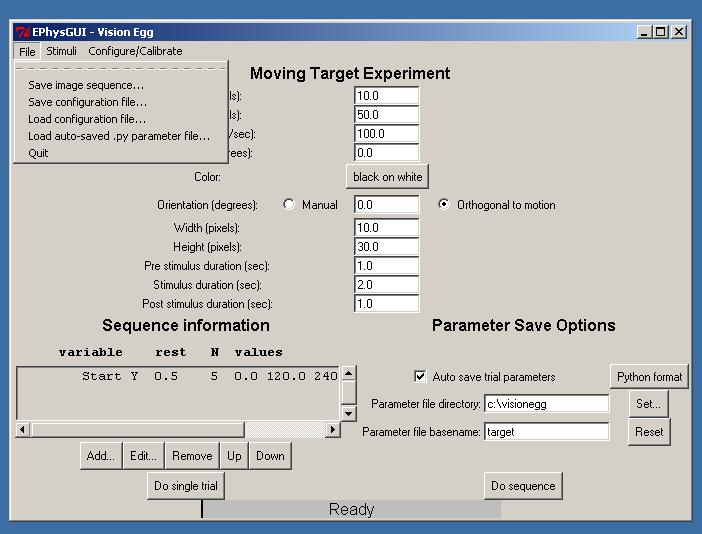 The ephys_gui and ephys_server are your gateway to electrophysiology experiments using the Vision Egg. Because I am an electrophysiologist, this is where I have optimized the user interface. There is a modular design which allows you to copy any of the existing experiment ‘’modules’’ and use them as a template for generating your own experiment using any of the built-in stimulus types. 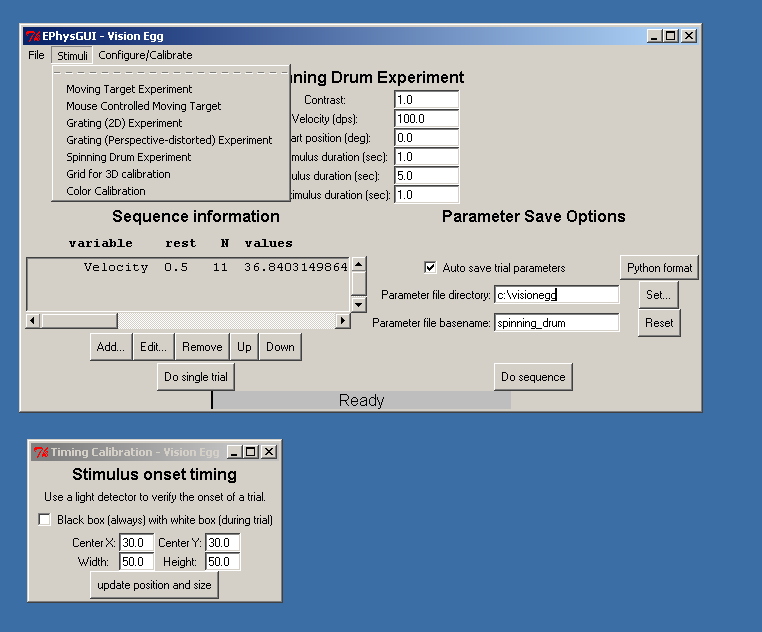 The first screenshot shows the stimuli included by default, the main window with parameter entry for the spinning drum experiment, and the stimulus onset timing calibration window. 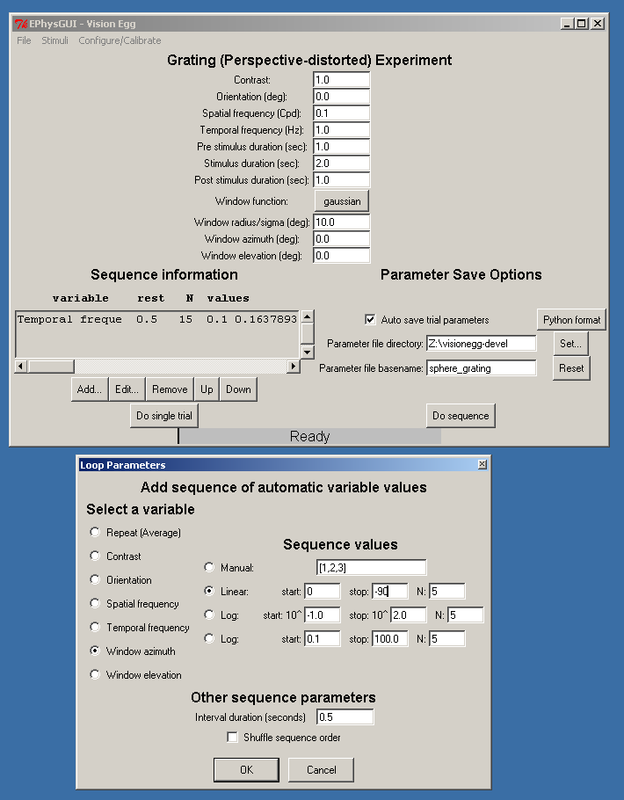 The screenshot below shows the perspective-distored sinusoidal grating experiment and the sequencer in use. The screenshot below shows that you have the ability to load parameter files and re-play them. 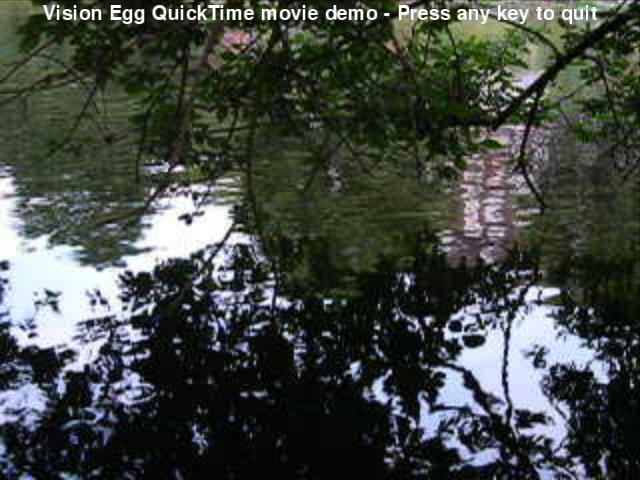 Also a particular trial can be (re)played as an image sequence so you can turn it into a movie.